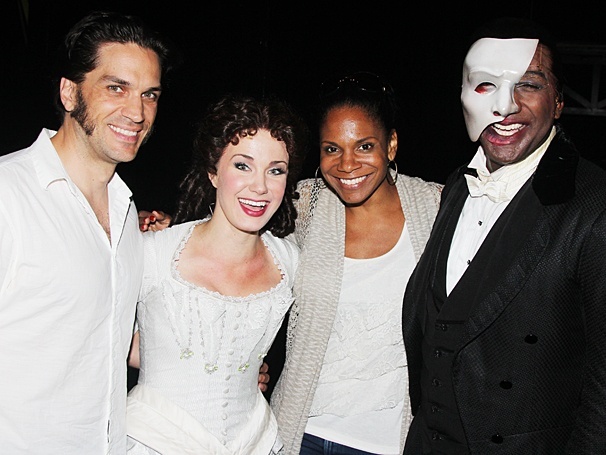 Will Swenson, Sierra Boggess, Audra McDonald and Norm Lewis take a sweet snapshot after the show. We always thought the Phantom had never-ending love for his main squeeze Christine, but we guess we were wrong! When six-time Tony winner Audra McDonald and her husband, Les Miz star Will Swenson, stopped by to see McDonald's former Porgy and Bess star Norm Lewis in The Phantom of the Opera on June 26, his new co-star Sierra Boggess could barely contain her jealousy. Click for pics!